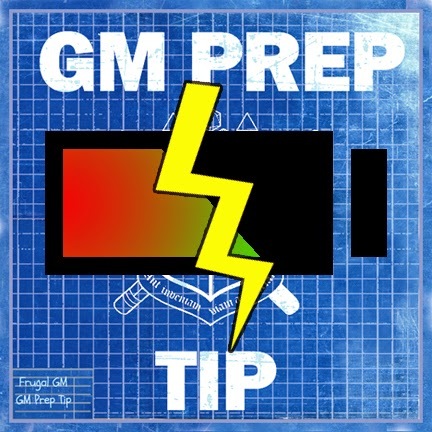 This GM Prep Tip might not be seen as a "real" prep tip, but I think it is something that is fundamentally essential for all GMs to consider because it can really have a noticeable impact at your home table: recharging your batteries. Of course I'm not talking about making sure the iPad you have queued up to view your gaming PDFs on, but the drive...the energy that it takes for all of us to run a game. GM burnout is a real thing and it can effect all of us. Far too often there comes a time when prepping and running a game for your friends just becomes more "work" that you have to do. I don't GM nearly as much as I should because my wife is our group's main GM, but I get to take the reigns during the holiday season and periodically throughout the year to give her a break. One of the things I've done to "recharge" my own interest in gaming....something that was waning dangerously low after years of constant GMing and volunteer work that frankly wasn't appreciated outside of my current roster of players, was form a campaign that I found interesting. A place I could try new ideas and try to tell a story instead of running a super-strict "by the book" game. I'm lucky in that the last year or so I've made a few like-minded "friends" out in RPG land and have been exposed to new ways to enjoy this hobby that I'd never have even considered years ago. This blog is one such outlet for me. I have another I'm working on that I think will work out nicely, but I don't want to jinx myself. 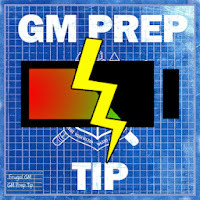 For many, simply sliding the GM screen to another position at the table is enough to keep from becoming too drained, if not actually recharged. Some people prefer to GM and others wouldn't feel comfortable GMing if they were paid tens of dollars to do so. Every table will be different based on the system used and the people at it. Honestly that is one of the reasons I like HackMaster is because there isn't that much a difference, at least knowledge-wise, between running a game and playing in one. All I'm really trying to accomplish with this post is to encourage both players and GMs to be cognizant of GM burnout and take measures well before you get to the point where you need to. Don't be afraid to change the status quo, or at least discuss changing it. You might find it beneficial to the health of your group and your game.